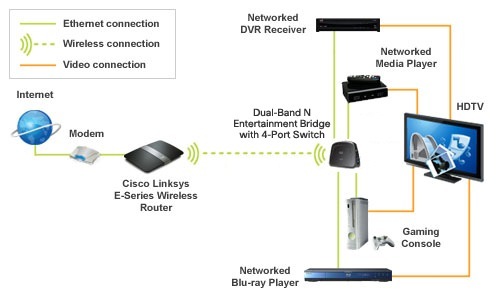 Linksys by Cisco launches the new WES610N dual-band wireless-N entertainment bridge optimized for streaming video and gaming. The bridge is designed to make any wired device, such as HDTV, Blu-ray player, DVR, gaming console, a part of your wireless network, getting them online. The Linksys WES610N has Fast Ethernet (10/100) 4-Port Switch and supports dual-band (2.4/5 GHz)Wireless-N offering up to 300 Mbps transfer rate. The bridge has three internal antennas and supports Wi-Fi Protected Access (WPA) security. The Linksys WES610N is priced at $129.99.